Take care of your brain with New Nordic's Clear Brain. Clear Brain combines walnut extract with ginkgo extracts, green tea and B complex vitamins that helps to support brain health, cognitive function and memory performance. Pomegranate extract (Punica granatum L.) (fruit) 75 mg.
Green tea extract (camellia sinensis L.) (leaf) 30:1 75 mg.
Ginkgo (ginkgo biloba l.) (leaf) 50:1 24% flavonoid glycosides, 6% terpene lactones 60 mg.
French maritime pine extract (pinus pinaster l.) (bark) 40 mg.
Walnut extract (juglans regia l.) (seed) 5:1 25 mg.
Black pepper extract (piper nigrum l) (fruit) 3 mg. 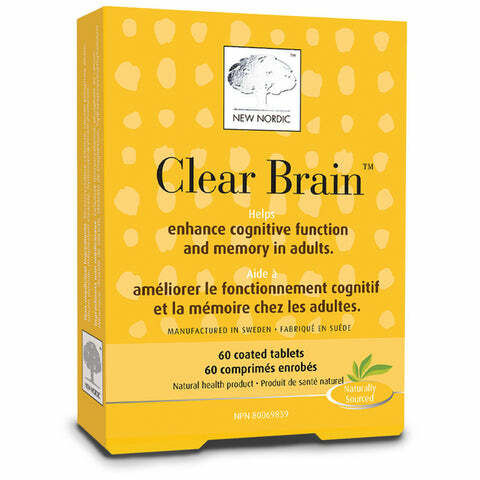 Helps to enhance cognitive functions. Helps to enhance the memory and brain performance. Consult a health care practitioner prior to use if you have a liver Disorder or develop symptoms of liver trouble (such as abdominal pain, dark urine or jaundice), if you have an iron deficiency, are pregnant or breastfeeding, are taking medications for diabetes, high blood pressure, or seizures, or any other medications or natural health products. Do not use if you are taking products that affect blood coagulation (e.g. blood thinners, clotting factor replacements, acetylsalicylic acid, ibuprofen, fish oils, vitamin E) as this may increase the risk of spontaneous bleeding. Do not take if you have allergies to walnuts or tree nuts.